Yes, I do like fusion. 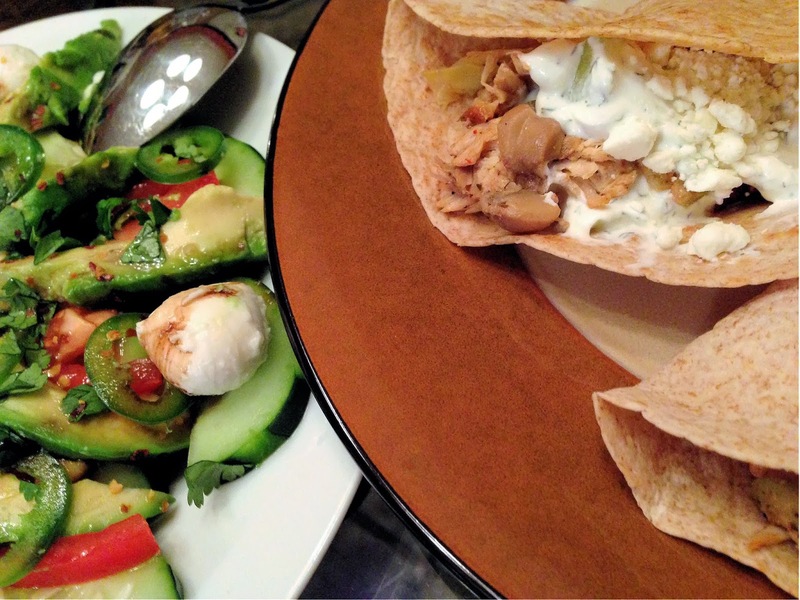 I love Tex-Mex, and I love Mediterranean, and today I found myself craving both. I would call this dinner Tex-Med, but I believe that term was already coined by a very successful food truck owner in Austin, TX. I have been trying to eat healthier, and have recently been on a kick where I neeeed olives…black olives, green olives, pepper marinated olives garlic-stuffed olives Kalamata olives… And then there are the sundried tomatoes, artichokes, and all those fun little tidbits you can pick up at the olive bar at your grocery store. Marinated mushrooms…roasted garlic…sautéed peppers… So many things you can do with these lovely little tidbits. Since pasta has been off the menu for a bit, in the name of cutting carbs, I’ve had to get a bit creative. No bread either, or I would seek out the ultimate muffaletta for that delicious explosion of flavors in the olive salad mix. But hey – I’m also in the mood for tacos (I’m generally always in the mood for Tex-Mex, so this is no shocker). And tonight, I just have to have a salad, but not just any salad. Mediterranean-ish… Caprese? Yes! But with a Tex-Mex twist. Sometimes these flights of fancy work out better than others, and this one was very tasty. It was also low carb, and quick and easy to prepare. 2 cups miscellaneous “olive bar” goodies, chopped (your preference- any combination of olives, garlic, peppers, etc. will make an excellent blend). Heat a large non-stick skillet on medium. 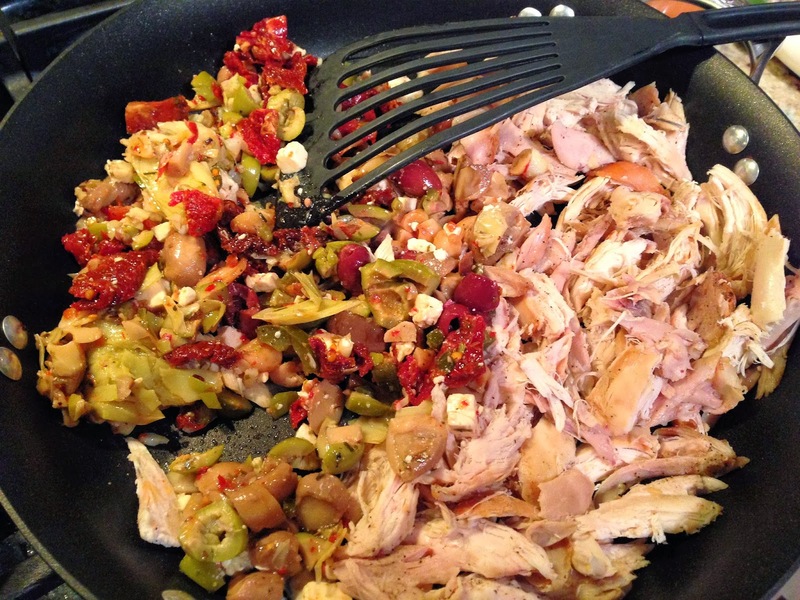 Add chicken, season with Greek seasoning blend, and heat just until chicken begins to sizzle. Add chopped olive/Mediterranean mix. Stir to blend and heat through. Cover skillet and reduce to warm/simmer. In a small heated non-stick skillet, heat each tortilla on both sides (usually about 15-30 seconds each side). Set aside in a stack. Tortillas are much better when heated by skillet, as microwaving can make them (and other breads) tough. 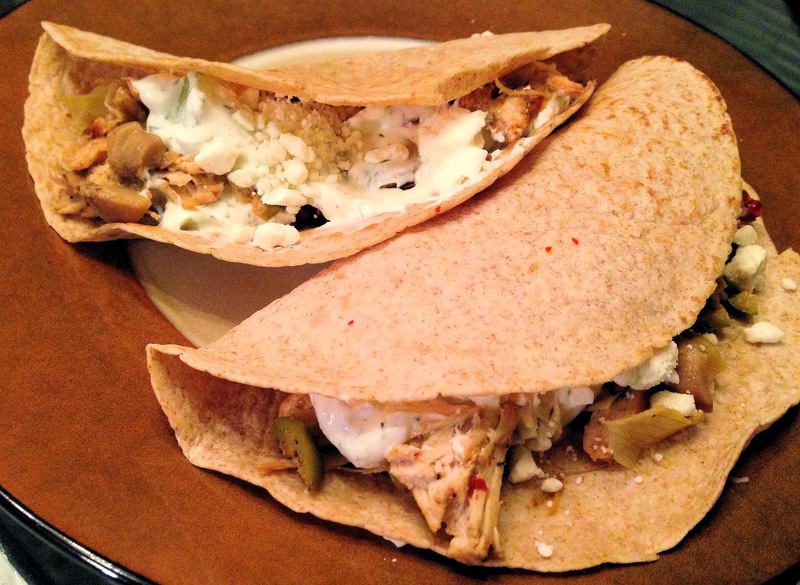 Stuff warm tortillas with chicken filling, and top with tzatziki sauce and feta cheese. 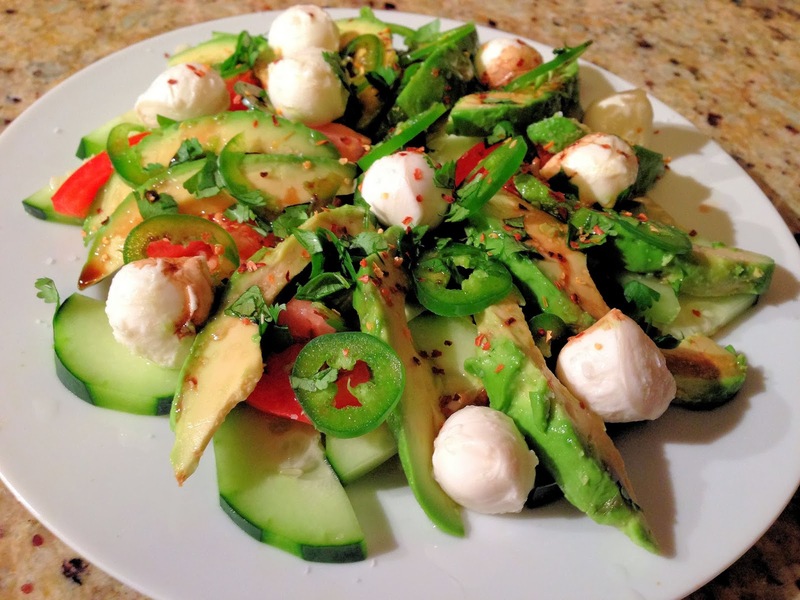 Arrange cucumbers on a plate, and top with a fanned arrangement of avocado slices. 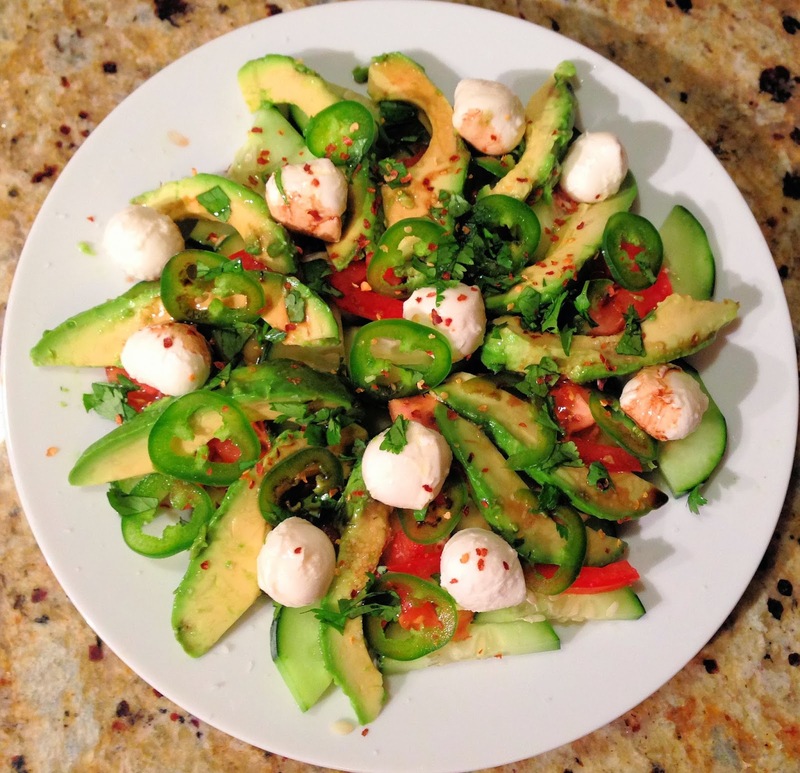 Layer with tomato slices, mozzarella balls and fresh jalapeno slices. Sprinkle with chopped fresh cilantro, and then season with kosher salt. Drizzle with balsamic vinegar and olive oil. Finish by sprinkling crushed red pepper on top.